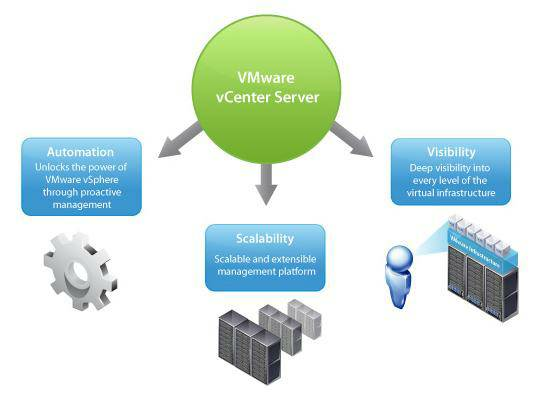 This VMware vCenter definition explains the features and capabilities of vSphere's centralized management tool. All the well-known features in vSphere -- such as VMotion, Storage VMotion, Distributed Resource Scheduler, VMware High Availability and Fault Tolerance -- require vCenter Server. VMware vCenter Server comes in two versions: Standard and Foundation. The Foundation edition is designed for small and medium-sized businesses that run up to three ESX servers. The Standard version, on the other hand, is for large-scale vCenter Server deployments. Visibility. vCenter Server allows you to configure ESX servers and VMs, as well as monitor performance throughout the entire infrastructure, using events and alerts. The objects in the virtual infrastructure can be securely managed with roles and permissions. Scalability. The visibility found in vCenter Server is scalable across hundreds of ESX servers and thousands of VMs. Using Linked Mode, you can also manage multiple vCenter servers within the same vSphere client. Automation. vCenter Server alerts can trigger actions. The Orchestrator feature in vCenter Server Standard allows you to automate hundreds of actions. VMware vCenter Server's three main functions. The following articles, tips, and blog posts will provide a more in-depth overview on VMware vCenter Server and vSphere 4.